HD Foundations Ends Foundation Problems. Get Solutions. 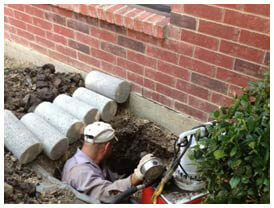 When foundation repair in Carrollton is needed, contractors at HD Foundations can help. We stop foundation issues. Our company offers a terrific guarantee and provides free estimates. If you require service performed by a qualified foundation repair company, contact HD Foundations. We remove shrubs and lay tarps around foundations, including cracked concrete slabs and pier and beam structures. Next, we excavate the soil underneath houses in order to install pressed steel foundation piers or pressed concrete foundation piers. This solves house foundation repair problems in Carrollton. HD Foundations makes concrete slab and pier and beam foundations even by lifting them onto the piers. We’re contractors that fix foundations using specific tools, including a hydraulic jack. We install steel foundation shims, as needed. If moisture is creating crawl space issues under your pier and beam house, we can perform crawl space repair to eliminate mold and rot. To find out more about the process of repairing your foundation, call us. We’re BBB-A+ rated by the Better Business Bureau. HD Foundations performs commercial and residential service. We’re a foundation repair contractor that does the job right. If house leveling service is required, we can install piers, re-shim your foundation and more. A sinking structure, foundation settlement, heaving, and cracks are all issues we terminate. 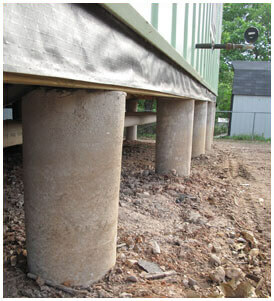 HD accomplishes this by installing interior or exterior foundation piers. We do this on Carrollton area houses because it’s the best foundation repair solution. We stop ceiling and wall fractures, exterior brick gaps, slab foundation cracks and other types of structural foundation damage. Our company prevents harmful water problems by installing foundation drainage systems. If your property has moisture-related foundation repair issues, we can help. Even concrete slab foundations can be affected. Water that isn’t directed away from houses accounts for about 10% of foundation problems. At HD Foundations, we stand behind our work. In fact, we offer a guarantee. So contact HD Foundations and obtain a lifetime foundation repair warranty. If you have foundation damage, let us know. 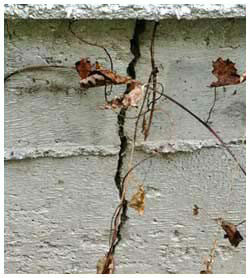 Property owners can obtain a foundation repair estimate free by scheduling it online today. We service houses, apartments and commercial complexes all around the DFW metroplex.